The Killing Floor Games were founded in February 2014 and have since been developing and growing to an more reliable event that is sponsored by Tripwire Interactive and Pingperfect. Sure you can kill the Patriarch and win public matches, but how well do you rate against other teams in a tournament? 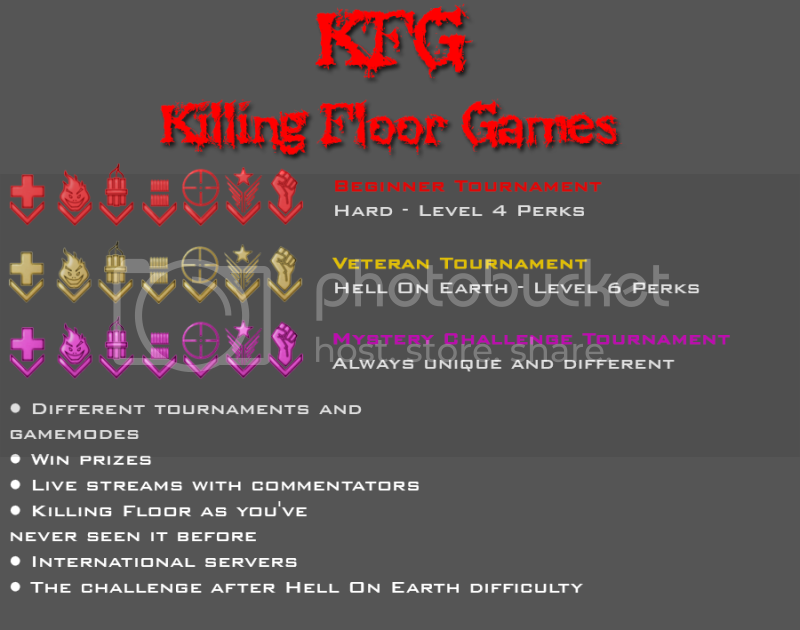 Show off your skills by competing in the Killing Floor Games! But wait... this is a CO-OP game. How do you determine winners? Teams are ranked by how quickly they can complete all 10 waves and defeat the Patriarch. The team with the shortest completion time wins. We have a unique rules set using our own custom mutator for fair and balanced gameplay, guaranteed to spice up the tournament with a competitive twist! Two separate tournaments are hosted for players both casual and advanced. All games in the tournament will be streamed live on Twitch.TV and will feature play-by-play commentary by the KFG team. If you have questions feel free to contact us via our website or steam discussion boards! Last edited by Jedi Mart; 01-30-2015, 03:04 PM.